Who was Red Cloud and why was this Native Indian chief famous? Summary: Red Cloud (1822�09) was a famous Native America chief and war leader of the Oglala Sioux Indians who fought against the US government's attempts to build forts along the Bozeman Trail in Wyoming and Montana. This conflict became known as Red Cloud's War 1865�68. He died on the Pine Ridge Reservation in South Dakota in 1909. The following fact sheet contains interesting facts, background history and information about the life of Red Cloud and the events in history that led to his fame as a great Native American Indian leader. Wars: The Sioux Wars (1854 - 1891), Red Cloud's War (1865�68). 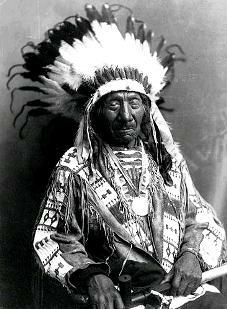 Red Cloud was the war chief during a two year conflict which was forever known as Red Cloud抯 War. In 1866 the US army began to build a road in Powder River country from the Oregon Trail to the goldfields of Montana. The main objective of Red Cloud was to prevent the White Americans in invading the lands of the Native Americans in Wyoming and Montana. Red Cloud showed the white Americans their strength during their little skirmishes which demonstrated how strong their tribes were. That may have been the reason why the American government offered a treaty during 1866. However, Red Cloud refused to sign the treaty and even stormed out during the negotiations and continued to show their superiority over the American troops which were dispatched within their region. In November 1866, Red Cloud led a massacre of a particular American infantry which were dispatched to fight them. A group of 81 men including two civilians was led by Captain J. Fetterman was dispatched from Fort Phil Kearny. They were task to dismantle a small Indian raid that was reported to their camp. Crazy Horse acted as a decoy leader helping to lure Lt. Colonel William J. Fetterman and 81 soldiers from Fort Phil Kearny into a trap. With 81 American fatalities, the Fetterman Massacre was the army抯 worst defeat in the West until the Battle of Little Bighorn in 1876 and spread terror amongst the white settlers.